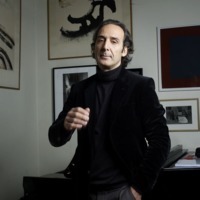 Alexandre Michel Gérard Desplat (born 23 August 1961) is a French film composer. He has scored several successful films in the late 2000s, including The Golden Compass, The Twilight Saga: New Moon, and Harry Potter and the Deathly Hallows. He won a Golden Globe for The Painted Veil. He has received four Academy Award nominations, five BAFTA nominations, and five Golden Globe nominations, winning the latter award for his work on The Painted Veil in 2006.